What the show reveals in many cases is moms who are exhausted ringleaders of their families’ lives, and the dads and kids who are content to let them fulfill that role. On Jan. 1, I eagerly settled in for a Netflix binge of Marie Kondo’s adaptation of her international bestseller “The Life-Changing Magic of Tidying Up.” The show ostensibly teaches the families it helps — and the viewers at home — how to determine whether clothes and other household items “spark joy,” and if not, to thank the item for its service to you, then peacefully let it out of your home and your life. The result is billed as a clutter-free, happier home, yet what the show truly reveals in many cases is moms who are exhausted ringleaders of their families’ lives, and the dads and kids who are content to let them fulfill that role. Kondo’s magic is life-changing – especially for the moms – once those families begin to truly share the running of a household. There’s palpable tension at the beginning of the first episode as the husband criticizes his work-from-home wife for sending the laundry out, even though he works 60-hour weeks and they have two small children at home. Another mom tears up as she describes the emotional weight of downsizing into a two-bedroom apartment with her family, and the pressure she’s put on herself to make it feel like home. “It’s my favorite room not to be in,” her husband says of the kitchen. He sheepishly admits he’s never cooked even one meal for his family there. Her son explains he likes having his mom in charge of knowing where all his stuff is, so that he doesn’t have to think about it. It’s easy to see how moms often begin taking on this all-encompassing responsibility for multiple lives, and also easy to understand how hard it can be to stop once you’re accustomed to making all the decisions and doing all the things. That’s not to say dads don’t often fill that role, as well, or that every mother does. In a later episode, it’s the mom who has the most difficulty adapting to Kondo’s method. But research suggests there’s still a persistent gender gap when it comes to who does the majority of the housework, one that even trickles down to children, and that doesn’t even include the onerous emotional load women sometimes carry for their families. Yet teaching each family member to be responsible for their own belongings, and by extension, for themselves, is a key component of Kondo’s KonMari method. Kondo is a mother — both of her daughters are under 4 years old — and realizing that she has two small children yet remains vigilant about organization is daunting (at first) to many of the families she meets on the show. Tidying is a behavior she models at home. 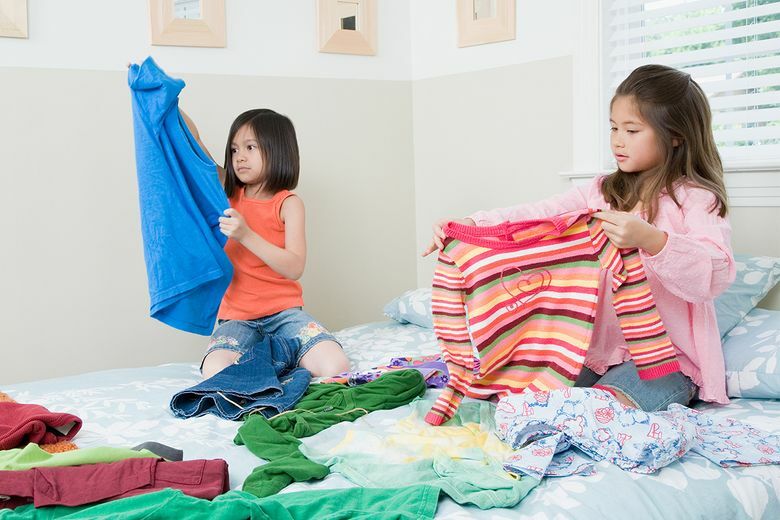 She says her children already emulate the way she folds clothes, and she involves them in determining whether their belongings spark joy. Research backs up Kondo’s idea that even very young children can be involved in the work of keeping a home running smoothly. Letting young children help with tasks such as washing dishes or sweeping – no matter how badly they did the task at first – showed up time and again as a huge part of how those children learned to capably handle bigger responsibilities later on, according to the article. With my own children, my attitudes toward their capabilities were wholly shaped by my son’s first year at primary school in Japan. Beginning at age 2, he was expected to remove his sneakers at the door and place them neatly in his cubby, hang his backpack on his hook and set his cup and cloth napkin neatly on the table each day. Even that bare minimum of neatness from a 2-year-old shifted my ideas about what might be expected from a toddler at home. Now, at nearly 5, he leads his 2-year-old sister in cleaning off the table. She’s taken to it so well that she attempts to clear off after finishing her meal at restaurants. By age 10, we’re hoping for Kondo-level methods of tidiness, although the current state of their American toy box doesn’t bode well. By the end of each episode, the families Kondo has assisted have been converted into true believers in her method. More importantly, there is joy — true, infectious, pure joy — on each of their faces. But the happiness and tears of the mothers are what resonates most with me. “I came around to check on everybody and I saw the most amazing thing,” the mom who’d downsized tells her husband after Kondo has worked her magic on the household. “Everybody had everything folded. They had it lined up, standing, nice and neat, on its own,” she says. Relieved of the emotional and household burdens they’ve been carrying alone, there is pride alongside the joy. Pride in their children, pride in what they’ve accomplished as a family and pride in knowing they are raising people who can take care of themselves. “The tidying process provides a unique opportunity to understand what is most important in one’s own life,” Kondo says during the show. She’s talking about belongings, but she’s also talking about creating a home. Most importantly, she’s talking about how to happily share life with the people who make it worth living – and to teach them to do the same.